Chicken is a great source of lean protein and really easy to cook. If you find yourself with leftover chicken after cooking a whole chicken, then here are some ideas of how to use it up. I thought this was a nice post to put up at this time of year when most people are trying to save some money. Not wasting any food is a really easy way to save some money. If you have been following me for a while, you will know that I am all about planning and preparation and saving as much money whilst still being healthy. All of those things are possible, and you don’t have to spend a lot of time doing them. My weekly food preparation changes every week depending on what is on offer, but one thing that I always make is that I roast a whole chicken and cut it all up to keep in the fridge and use in meals throughout the week. In the beginning when I first started doing food prep, inspiration for what I used the chicken for ran dry pretty soon after the standard sandwiches and salads, but as time has gone on, I have gotten a little more creative with what I use it for and I thought I would share those things in a post. Feel free to leave your own ideas in the comments too. 1) Chicken Salad – This can be such a versatile dish, as you can throw in any salad ingredients you have and use any grain you like (brown rice, quinoa and couscous are all good) to make it even more budget friendly. You can keep the dressing simple with just olive oil and vinegar or get a bit more creative and make up a basil, balsamic and mustard dressing. If you want to make the chicken creamy, swap out the mayo for Greek yoghurt to save some calories and fat. 2) Chicken Pasta Salad – Not only a good way to use up leftover chicken, but a good way to use up leftover vegetables. This makes a good lunch to take to work if you don’t have the facilities to heat anything up. Maybe one for the warmer months! 3) Chicken Sandwich – Look beyond a plain chicken and mayo sandwich and make something that is going to bring those leftovers to life. I love this Pesto Chicken and Roasted Vegetable Sandwich that is equally suitable for lunch by yourself or if you have guests over. 4) Mexican – I don’t think that there is a week that goes by when we don’t use our leftover chicken for some kind of Mexican dish. One of the simplest Mexican dishes to make is a Chicken Burrito Bowl as you pretty much just throw everything in and there are no rules – just use what you like. 5) Soup – Chicken Noodle Soup is a must if you are feeling unwell, but don’t just save it for when you are sick, it is a very quick and budget friendly meal that uses up both leftover chicken and vegetables. Want to save even more money? Make sure you use the chicken carcass to make your own homemade stock – it is cheaper and will have less things added to it. 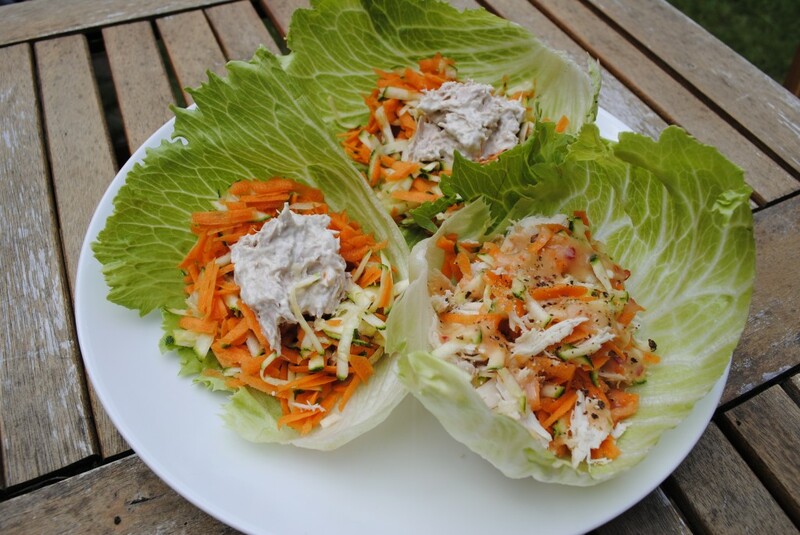 6) Lettuce Wraps – One of my favourite things to eat at the moment. Healthy, quick and you can put anything in them. I have even been putting leftover turkey chilli in them, although that can create a bit of a messy lunch. If I am making chicken lettuce wraps, then I will take a lettuce leaf (iceberg or romaine) and fill it with chicken mixed with Greek yoghurt, chipotle sauce, chopped peppers, tomatoes and cucumber. It is more filling than you think it would be. If you are not a fan of Greek yoghurt, use mashed up avocado instead. 7) Pizza – A healthy eating website just mentioned pizza?? *gasp*. If you are new to the blog, then my definition of healthy is being balanced and you can bet that includes some pizza once in a while. If I am going to eat pizza, I always try to make it myself, but mainly because it does taste better if it is homemade. These Flatbread Pizzas are my favourite. 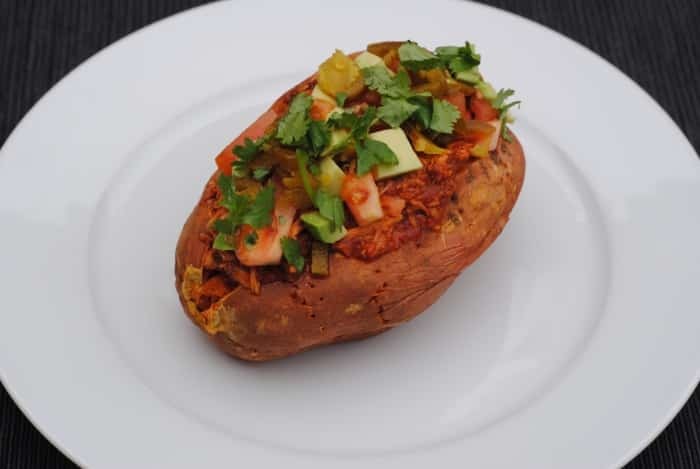 8) Stuffed Baked Potato – Meals don’t come much cheaper than a stuffed baked potato. Add in some leftover chicken, whatever vegetables you have on hand (brocolli goes well) and a mixture of whatever cheese you have in your fridge. 9) Curry – Want to add some spice your your life? Then make yourself a homemade curry. Curry can as spicy or as mild as you like, so don’t be put off if you don’t like spicy food, as curry is all about flavour. This Burmese Chicken Rendang is a simple way to ease yourself in to curry cooking if you have not made one before. 10) Lasagna – You might think that lasagna has to be made with ground meat like beef or turkey, but it works just as well with shredded chicken too. If you are trying to cut back on carbs, then try this low carb lasanga. If you still have lots of leftover chicken at the end of the week and you won’t be able to eat it all, then shred it up and freeze it for later. The less you waste, the more you save! What are your favourite ways to use leftover chicken? Leave a comment below to share your ideas. Please add me your list. Chicken salad is probably the easiest way to use up leftover roasted chicken and is just as yummy on bread as a sandwich or served over lettuce if you want to cut the carbs. Very handy, Dannii! Because there is so often leftover chicken and whiny people in the house who don’t want to eat it. Great post idea! Haha, I don’t understand people that don’t like leftovers! These are all great idea, Dannii! We make a lot of chicken and I am always looking for ways to use up our leftover chicken. My husband’s favorite is when I make chicken enchiladas or chicken fried rice or noodles. Oooh, chicken fried rice. Good idea! Great minds! I aim to cook a chicken once every 2 weeks and use it for curry, soups, bone broth, stir fry, chicken nuggets and anything else I can think of! There is so much you can do with it! It’s one of my favourite ways to use leftover chicken. Chicken lasagne was a bit of a discovery for us. We like making a Mexican lasagne. I really like this post, Dannii, because the ideas are very practical ones that I’ll actually use! Great reminder to get a whole chicken – it’s really economical, apart from anything else. I particularly like the lettuce wrap idea! It’s all about saving money this month! It’s such a comforting meal. Enjoy! I’m going to send this to my mom! She eats chicken all the time and always has leftovers. Great ideas! I make a whole roasted chicken every Sunday for quick meals during the week! It saves so much time, doesn’t it! 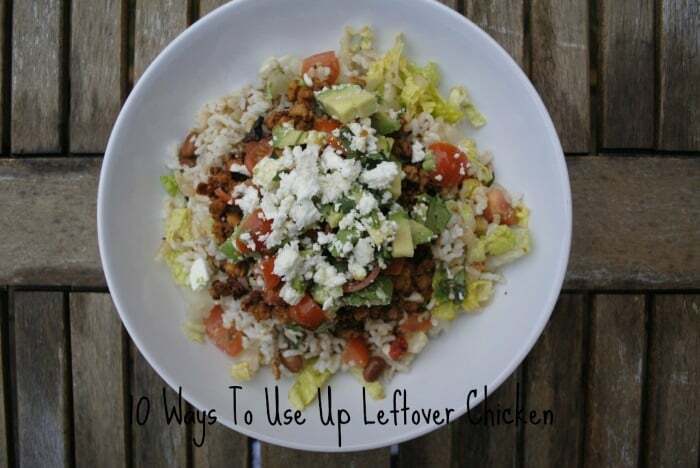 I don’t eat chicken but I love these tips for leftovers! You can do the same with beans for most of these recipes. Haha oh yes, how could I forget chicken and brownies! Chicken noodle soup is one of my classic favorites. I also like the idea of making chicken lettuce wraps, I’ve been meaning to try making them! Chicken noodle soup is always my go-to meal when I am feeling sick. This is so great!! I love all of these ideas!! Seriously so healthy and tasty and so man options!! I am a huge fan of chicken soup!! …and chicken stuffed potatoes are AMAZING!! Seriously the best! I love that combo! Chicken and sweet potatoes is the way forward! I’m always looking for new ways to use chicken! All these ideas look great, Dannii! thanks for sharing! I actually don’t miss the bread wrap and really like the lettuce alternative.